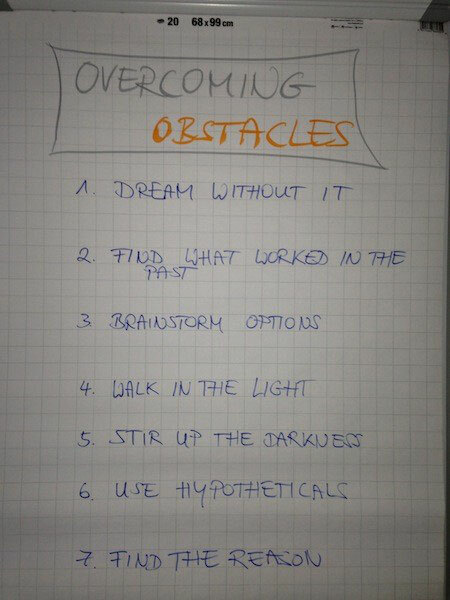 We did not use the "Overcoming obstacles" tips, but you can see them on one of the pictures at the end. 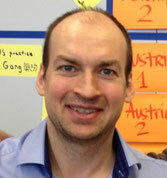 Pair Coaching was simply, that we had two coaches who were complementary with the same coaching method. 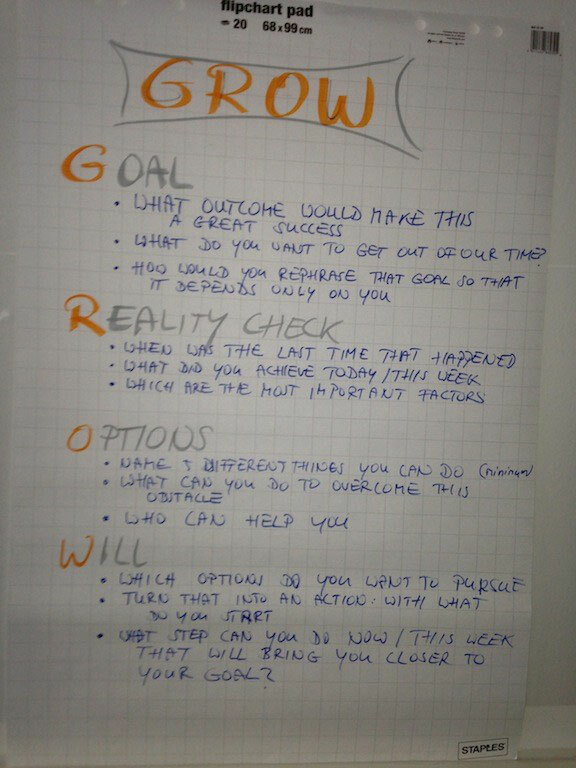 The GROW model was quite easy to use, due to the clear structure, and the questions we could read from the flipchart. But you should really learn or internalize good questions for each step. Pair coaching worked really well for both of us, cause you have time to think of the next questions, when you colleagues takes over. Additionally, the other coach could always easily step in after a lapse. 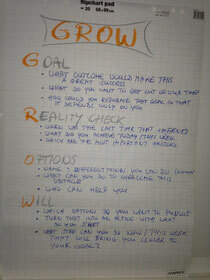 Our biggest complaint about the GROW model (also stated by both observers) was, that focusing on the goal or on the "reality check" let us not understand, what the real problem of the coachee or the real problem to be solved was. This also left the goal fuzzy, e.g. because there were way to many goals which we were told. I was under the impression, if you just ask for the goal and not dig deeper, you will only scratch the surface of the problem and even if the coachee achieves his goals, that this might not solve the real problem. 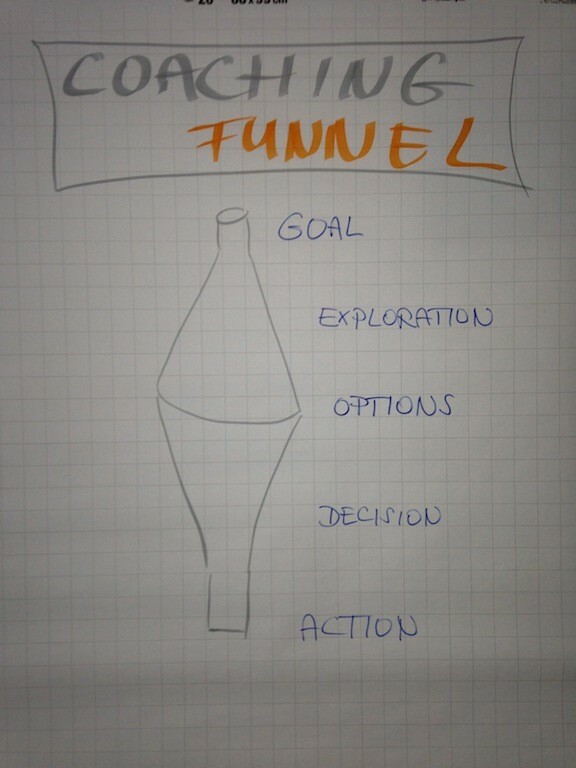 This reminded my of the Big "A" Agenda open space session of Ilja & Deborah at Agile Coach Camp DE 2013.